The Special Commission of Inquiry into the Greyhound Racing Industry in NSW was set up on 6 May 2015 by the NSW Government in response to the ABC Four Corners program depicting live baiting in the industry. Following the commission's findings, NSW Premier Mike Baird announced a ban on greyhound racing in the state, effective from July 2017. Despite overwhelming community support in favour of the ban, Mike Baird reversed the decision on the 11th of October 2016. Read the RSPCA NSW Media Release, post the reversal of the ban. Please see below for more information relating to the inquiry. NSW Premier Mike Baird reverses the decision on the 11th of October 2016. 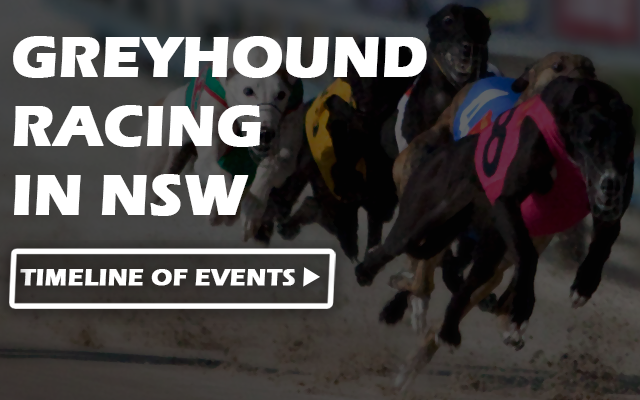 NSW Premier Mike Baird announces a ban on greyhound racing, to commence on 1 July, 2017. ACT Chief Minister Andrew Barr announces "there is no future for this industry in the ACT" after the NSW report was released. "We will consider the findings of the NSW report before announcing a process to end the practice of greyhound racing in the ACT." Commissioner McHu​gh AC QC provided his report on the Special Commission of Inquiry into the Greyhound Racing Industry in NSW to the Governor. The NSW Government launches the Special Commission of Inquiry into the Greyhound Racing Industry in NSW. The Honourable Michael McHugh AC QC is appointed to lead the inquiry.